We thank the Lord for His mercy and Grace. 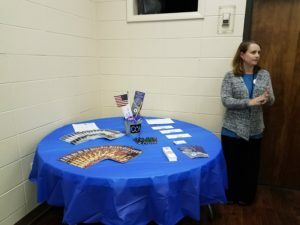 We were honored to co-host a community open house event in November at Colquitt Christian Academy that was well received by all in attendance. Please continue to pray for this young school to increase enrollment and to attract and retain God-fearing teachers who catch the vision of Classical Christian education. Pray for the families and for the Christian community in Moultrie, GA to support the school. We also enjoyed the church’s anniversary and the graduation ceremonies for Yo Soy Jesus school students while we were in Peru. 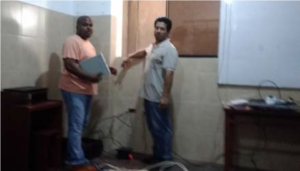 IT mission partner Richard Hendricks installed much needed Wi-Fi access points at the school and David helped run wires. A return trip was necessary in February to finish installation of security cameras and Wi-Fi components as well as a smart board for the computer lab (with help from a local contractor). Construction in the field is difficult and American power tools often are not compatible with South American electrical outlets even with adapters. CCEI, Inc. also replaced the broken guitar used for church services and school music lessons. Christy Anne shared with teachers about the Seven Laws of Teaching during in-service preparation for the new school year which in Peru runs March –December. 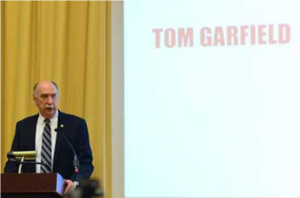 Also in February, CCEI, Inc. enjoyed speaking at the 2018 Gala Dinner for Grace Christian Academy in New York. 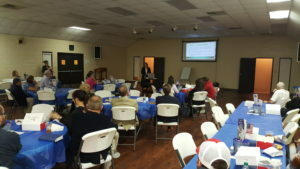 Guest Speaker Tom Garfield of the Association of Classical and Christian Schools also participated with his wife, Julie. We were hosted by Headmaster Steve Schultz (below, right) and his wife Genie. 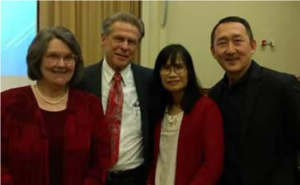 Fellow Classical Christian educators Pastor Lenny and Linda Cheng from Queens, New York attended the dinner as well and made sure to come by and greet us warmly. 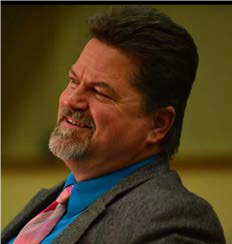 Later this spring, we will finish up both Telos Classical Christian homeschool studies for the year with CCEI, Inc. Vice President Ann Preece’s grandson, but also the doctoral studies for Christy Anne Vaughan. Graduation ceremonies and celebrations will commence at Liberty University in May. Prayers in agreement for successful completion and travel are greatly appreciated. Prayer requests: Please be in prayer for start-up and young schools in Queens, NY; Sao Paulo, Brazil; Washington, D.C.; Moultrie, GA; Ocala, Florida; Uvalde, TX; Brown County and Felicity, Ohio; Lima, Peru; as well as a larger building to house the increased enrollment at Grace Christian Academy in Merrick, New York (Long Island) and for a unified campus for Christ Classical Academy in Tallahassee, Florida. Please pray for our mission trip to Dominican Republic in July and for teacher volunteers for the work there. We still seek a bi-lingual editor for Spanish translation of texts. Pray health, healing and wholeness for Abigail Varillas’ mother Flor who suffers from diabetes. 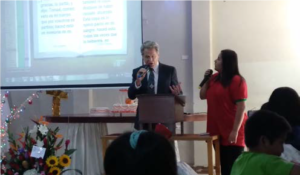 Praises: At the annual Grace Christian Academy Gala dinner February 10, 2018 CCEI., Inc. was asked to help plant a Classical Christian School in Dominican Republic with Missionary Mike Minott. Abigail Varillas and Christy Anne Vaughan will travel with a team in July to assess student needs and a starting point for instructional materials. Our web site: www.2CEI.ORG received a facelift thanks to Only Two Fish.com. Please check it out and visit http://onlytwofish.com as well.